Do you know where your motorcycle is right now? In your garage? In the car park? In your garden? Really…? Is it? Got you thinking now hasn't it! Do you know where your motorcycle is right now? In your garage? In the car park? In your garden? Really…? Is it? Got you thinking now hasn’t it! How about knowing where it is every second of the day, with a text alert if someone tries to steal it & a dedicated team watching it 24/7/365 days a year. Around 80 motorcycles are stolen every day in the UK. 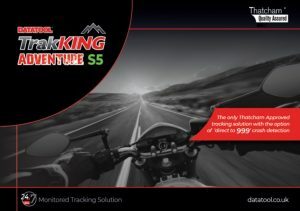 Datatool TrakKING Adventure S5 offers full journey history logging and the ability to create location or event based alerts. In normal use, TrakKING Adventure will record the vehicle position every 15 seconds and upload that data to the cloud every 2 minutes, giving you a permanent record of every journey. TrakKING Adventure is a true pan European product, with coverage available in all of Western Europe and many countries beyond. Routes can be downloaded and shared with friends and points of interest can be recorded for future reference. Early Warning Alerts: At the first sign of movement, you have the option of receiving an SMS text alert. For supply & fit costings please see our Price Guide.